Sure, Ensco's revenue slid again, but this looks like it is a temporary thing as the company gears up for 2019 with new contracts and a merger. Things were really looking up for Ensco (NYSE:ESV) this past quarter. The company had previously posted its first revenue increase in years and management felt comfortable enough with its financial standing and the current offshore rig market that it announced a merger with Rowan Companies (NYSE:RDC). While Ensco posted a slightly smaller loss than expected, it wasn't able to post another quarter of revenue gains. In the long run, though, that may not be a big deal. Here's a look at Ensco's most recent quarter, why this revenue slip shouldn't be too much of a concern for investors, and what investors should expect in the upcoming quarters. Data sources: Ensco earnings releases. EPS = earnings per share. After posting its first increase in revenue for the first time in years in Q2, Ensco's revenue slipped again this past quarter. Despite the new contracts it had signed so far this year, there were a lot of rigs that rolled off contract this past quarter that led to the revenue decline. Here's the good news: Many of those rigs that rolled off contract were able to secure new jobs. According to Ensco's most recent fleet status report, the company secured 16 new contracts or extensions. Many of those won't start until January or April of 2019 because the producers that leased these rigs are doing so on their 2019 capital budgets, but it is clearly a positive sign for Ensco. More important than Ensco's quarterly earnings was the announcement earlier this month that it and Rowan would be combining in a $3.9 billion deal. Adding Rowan to Ensco not only grows its fleet of high-specification floating rigs, but it also helps to address one of the largest concerns for Ensco: Its fleet of older jack-ups. Rowan has a large fleet of modern jack-ups and a big portion of them are designed to handle harsh environments. Combined, the company will have the largest fleet of jack-up rigs, as well as the second-largest fleet of floating rigs, many of which are capable of handling complex jobs in water depths of more than 10,000 feet. Management expects to close the deal in the first half of 2019. This is the second major acquisition Ensco has made during this market downturn (the first being the acquisition of Atwood Oceanics for $6.9 billion last year). This is an industry that was in dire need of consolidation, and Ensco was one of the few companies with the balance sheet and the contracted backlog of work to do deals. Higher levels of customer demand have led to new contracts and extensions for several rigs in our fleet across a range of water depths and geographies. ENSCO DS-9 and ENSCO DS-12, two of our highest-specification drillships, were awarded contracts in South America and West Africa respectively. We also won new contracts for versatile semisubmersibles ENSCO 8503 and ENSCO 8505 in the Gulf of Mexico along with sister rig ENSCO 8504 offshore Japan. Further, contract awards for high-specification, harsh environment jackups ENSCO 121 and ENSCO 122 in the North Sea demonstrate a clear customer preference for high-quality rigs that can deliver the greatest efficiencies for their offshore well programs. This past quarter probably wasn't the result investors were looking for, as revenue slid again, but the contracts Ensco signed are a clear sign that things are getting better. Next quarter may also be a tougher one, as many rigs will have to mobilize, which will likely increase costs without more revenue coming in the door. Once they start drilling in 2019, though, we should see a considerable improvement in Ensco's results. With the addition of Rowan coming down the pipe, Ensco is looking more and more attractive as an investment. 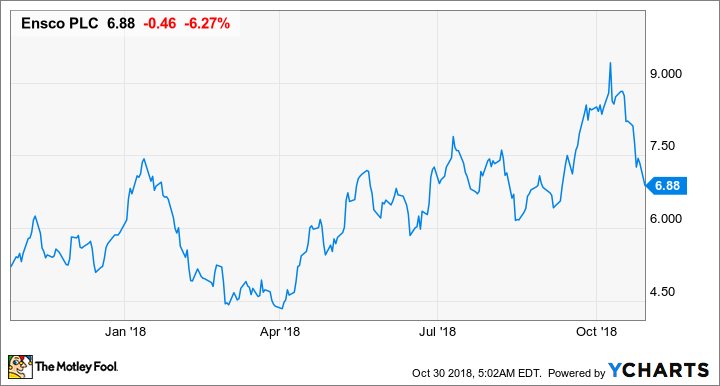 The stock already looks dirt cheap with shares trading well below book value, and the addition of Rowan will give the company about $1.9 billion in cash to see it through these last few challenging quarters for the offshore rig industry. For those willing to wait a long time for a payoff, Ensco stock could be worth a look.